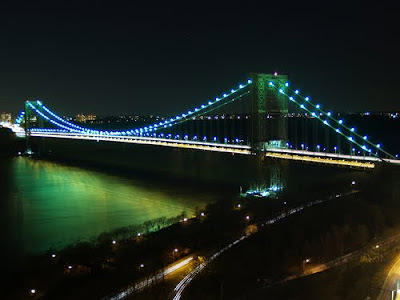 Erik Wander of New Jersey's Fort Lee Patch reports that Girl Scout Councils in New Jersey are holding a ceremonial “bridging” event later this month, during which as many as 5,000 girls, volunteers and alumnae will cross the George Washington Bridge from Fort Lee in commemoration of the 100th anniversary of Girl Scouting, the organization announced. “Bridging” is a traditional ceremony among Girl Scouts, signifying the passage from one level of scouting to the next, and organizers decided to do it on a large-scale this year to mark the organization’s passage into its own next century. Brooks added that all four New Jersey councils—the Girl Scouts of Northern New Jersey, Central and Southern New Jersey, Heart of New Jersey and Jersey Shore—will come together “to celebrate this milestone,” and the councils say that because of interest from Girl Scout organizations in neighboring states, they are opening the event up to Girl Scouts nationwide. Port Authority Deputy Executive Director Bill Baroni also issued a statement on the Girl Scouts’ big day, calling it, “a monumental event” that “will be remembered by generations to come." "We are proud to come together with an organization as steeped in history and tradition as the Girl Scouts,” Baroni said, noting that the bridge itself, which he called an “American icon” celebrated an anniversary of its own recently—its 80th. In addition, the Port Authority will light the “necklace lights” on the George Washington Bridge green in November in honor of the 100th anniversary of the Girl Scouts, much as the agency lit them pink for Breast Cancer Awareness Month in October.